I want to invite all DigiDame readers to a very special event during Art Basel at 110 Washington Avenue, CU-3, Miami Beach, Florida, on Saturday night, Dec. 7th, 6pm to 9pm. The exhibit will be open from Dec. 3rd to the 29th. 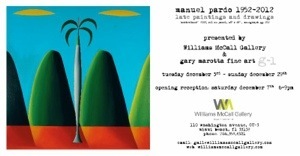 Our good friends, Gail Williams and Dawn McCall, of the Williams McCall Gallery South of Fifth, along with Gary Marotta Fine Art G-1 Gallery of Provincetown, are presenting the extraordinary late paintings and drawings of New York City artist Manuel Pardo (1952-2012). Pardo became well known when Marcia Tucker, founder and director of the New Museum in NY, included his work for the groundbreaking exhibition in the 80s, The Other Man: Alternative Representation of Masculinity. 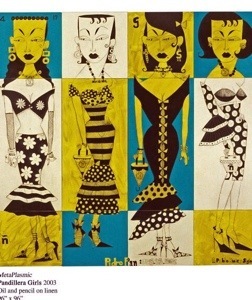 Pardo went on to exhibit internationally in solo exhibitions in New York, Paris, Mexico City, Cologne, Havana, and Milan. Corporate commissions and events include The Motherland Series; Murals by Manuel Pardo at the British Airways terminal and JFK International Airport; and Hérmes & Visa for Masaryk: Arte Moda & Visa, curated by Justo Sierra, in México City, México. Pardo was born on July 4th in Cardenas, Cuba. He died in November 2012 after a short illness while enjoying the success of his show entitled Stardust at California State University Fullerton. The artist’s obituary, written by David Frankel, Senior Editor, Publications Department, Museum Of Modern Art, New York appeared in The Huffington Post on May 16, 2013. Pardo’s work tells his life story of a ten year old boy emigrating, against his will, to the United States from Cuba on Operaciòn Pedro Pan. In his best known series, Mother And I, the artist pays homage to his mother. 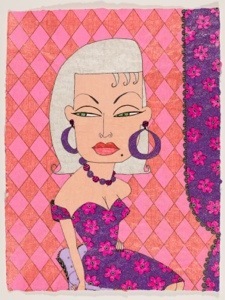 Pardo depicts his mother Gladys adorned in couture clothing in lavish surroundings with elaborate patterns, colors, and details often referencing popular culture in the context of the work. Other works like Motherland represent a boy’s last memory of Cuba with a lone palm tree standing in front of a highly stylized mountain range. Collectors and supporters include Sondra Gilman and Celso Gonzalez-Falla, Henry Luce III, Joan Sonnabend, Mike McGee, and Andrea Harris. This entry was posted in digital, senior lifestyle, tech and tagged Art Basel, Manuel Pardo, Williams McCall Gallery by loiswhitman. Bookmark the permalink.